The Vancouver 2010 Winter Olympics are nearly upon us. In the run up to the games, the Olympic Torch has been on a 106–day long relay journey across Canada, with the flame covering some 45,000 kilometres in that time! 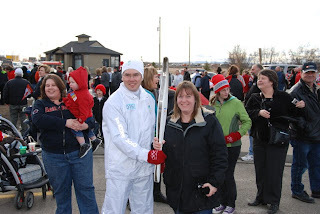 The torch relay has been a huge event over here, a source of great local pride as it has visited one community after another. We have been amazed by how much support there has been. 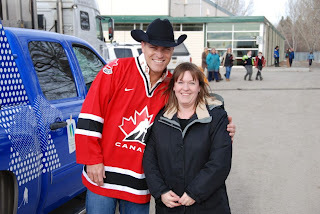 So on day 81 of the relay, when the flame reached High River, we thought we just had to go and witness what could be a once in a lifetime event. This is one of the Olympic flags that were lining the local streets. As the torch was planned to run past our office, we decided to put up our RE/MAX balloon. The presenter was very good, and very engaging. We have seen him on news coverage also hosting these events elsewhere so he might have covered a good few kilometres himself by now! Darrel Janz is our local news presenter on CTV - he too was one of the presenters. He introduced a local Jazz band comprising of 3 local schools and they were pretty good...here's a video of it. If you are reading this on Facebook, the video may not work and so you can click here to see this post on our blog. This was followed by a painter sponsored by the Royal Bank of Canada, who just seemed to use his hands to paint as his canvas constantly spun in front of him. He was quite amazing to watch. But you just can't help yourself, you have to ask "do you know what it is yet?" 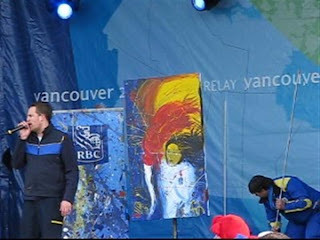 The finished painting (a picture of an Olympic Torch Carrier), was presented to the Mayor for it to stay in High River. 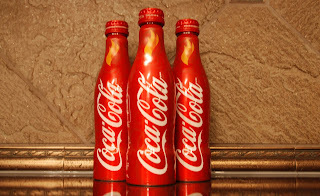 Coca Cola were handing out special 2010 Olympic branded aluminium bottles of Coke. As he was coming off the stage, we managed to get a few more shots of him. Here's the torch coming into High River and making its way to the stage. The torch on stage and lighting of the couldron. The Torch Running past the office in High River on its way to Okotoks. It was indeed quite something and we are both very glad we had the opportunity to experience it - we were surprised by how much you are drawn into the spirit and emotion of it.